I’ve been a little slow with the blog updates recently, but hopefully that’s going to change soon. I’m in the process of updating my website, and transitioning to Tumblr—so stay tune for a whole new look. And I have even BIGGER news to report! I inked a new book deal! I have a short story trilogy coming out in Fall 2013 that turns the Narcissus myth on its head. Imagine a paranormal secret agent infiltrating high schools to rid the world of shallow people. Sounds awesome, right? Well, let me tell you a little more. 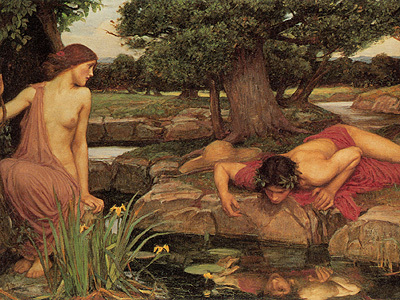 First, let’s start with the Narcissus myth. For those who don’t know, Narcissus was a beautiful and proud hunter incapable of loving anyone but himself. He was so vain, in fact, that the goddess of revenge, Nemesis, attracted him to a pool of water where he fell in love with his own reflection and died gazing at his image. My new stories feature Emmy and Nara. Eighteen-year-old Emmy is in the family business—trapping vapid narcissistic souls into her silver compact mirror for all eternity. It’s what the Rhamnusia family has been doing for thousands of years, all under the direction of Great Grandmother. Only Emmy’s latest assignment, Nara, is about to prove more challenging than she ever expected. Gorgeous and self-absorbed, Nara is unflinchingly cruel to her classmates. Even her boyfriend, Luke, can no longer tolerate her actions—much to Emmy’s relief since she finds Luke a little more than intriguing. But when Emmy tricks Nara into gazing into her mystical mirror, what she finds there is not what she’s expecting. The first story in the trilogy, Sucked Into The Looking Glass (working title), will debut in Fall 2013 through Buzz Books! Even more exciting—each short story will be released as an individual ebook, then later compiled with the short stories from two other fantastic YA authors to form the MythologyHigh anthology. The full anthology of all nine stories will be released as an ebook and a print book at the end of this year! I’ll keep you posted!